Having written about breakfast, brunch and coffee places lately, it’s high time I gave a recommendation for lunch and dinner. As you might know, one of my favourite places in London was Thai Metro, a basic little Thai place with the tastiest stir-fries and curries. 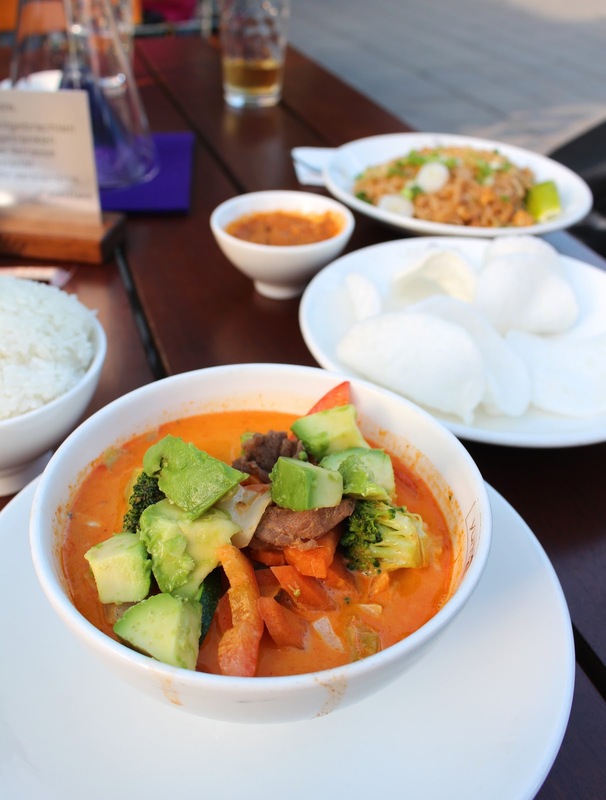 In Munich I hadn’t tried any Thai places, and since my friend was craving it for days, we headed to Yum2take on a warm Sunday evening, after a day of tanning at the Isar. Yum2take has a pretty simple and quick concept. You check out the menu, pick a dish, pay at the till where you receive a buzzer which lights up when your food is ready (a bit like Dean & David). It’s quick & dirty. Not the kind of place where you’d go for a relaxed dinner but as a quick fix for Thai food cravings, this is where you need to go. Yum2take has two branches in Munich, one in the North at Hohenzollernstrasse and one in the middle of the city at Viktualienmarkt. We went to the latter, where we got some seats which were perfect for catching the last rays of sunshine. The menu is really elaborate so it's hard to choose at first. I ordered a special from the menu: spicy beef curry topped with avocado (+ rice). Unusual combo, but I like it, avocado never hurts right? My friend had a Pad Thai which was rather on the small side. The one at Thai Metro in London is definitely more generous and tastier. My curry was good and had the perfect amount of spice. The avocado went really well with the spiciness of the dish. Something I wouldn't have come up with so I'm glad I tried this. I must say that there wasn't very much beef in my curry but I didn't mind so much. Though, it's something to take into account if you're expecting a lot of meat. If you don't have high expectations of Yum2take, it's an easy option if you're in the mood for some Thai food. It's kind of a fast-food experience, but the outside seating area in the middle of the city centre makes it a good spot for lunch or early dinner. Yum2take also does deliveries if you're having a Netflix-kinda-night.